A private boat ride on the Arno River gives you an entirely new perspective of Florence and a unique way to view the city. Your private English-speaking guide will meet you at your accommodations before transporting you to board your “barchetto”, one of only four original traditional Florentine wooden boats. En route to the boat, you pass some of the main sites such as Piazza Signoria, Uffizi Gallery, and the beautiful Ponte Vecchio. On board your “barcaiolo” will navigate the Arno as your guide shares the secrets of the river and the beautiful Florentine Renaissance palaces. 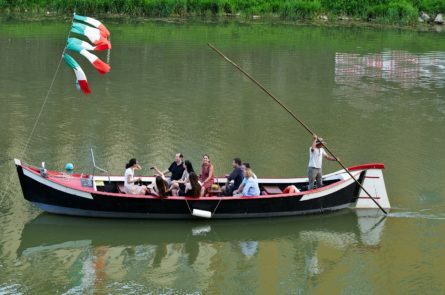 As the Arno river cruise wraps up, you’ll have the opportunity to enjoy an aperitivo on board! Sip some Prosecco and enjoy Italian nibbles, before having a delicious dinner at a local, authentic trattoria to taste the best of the local flavors! The boat ride is also perfect as an introduction to the city and can be arranged in the morning or afternoon. Tour departure may be cancelled due to rain. During your private Florence artisan tour, enjoy exclusive visits to mosaic and leather making workshops, as well as a tour of the Bargello Museum.